Christopher Golden is an acclaimed American Author. He has worked in Horror, Fantasy, Teen and Young Adult fiction. He's known for his tie in novels for Buffy the Vampire Slayer and his collaboration work with Mike Magnolia, Nancy Holder and Amber Benson. 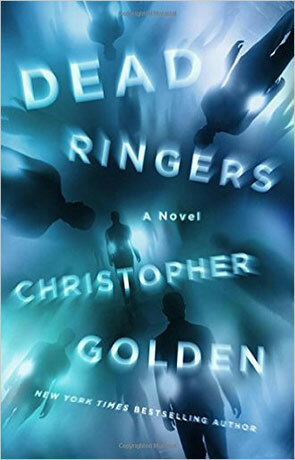 His latest book ‘Dead Ringers’ is a standalone supernatural horror that plays on the fears of identity. Upon devouring this book, I’ve discovered Golden is not an amateur when it comes to horror and character development. Golden asks big psychological questions: how do you react when your doppelgänger, the perfect self you always dreamed you could or wanted to be, came crashing into your life? Golden masterfully points a mirror at his characters and reflects their own raw human flaws back at them and at his readers. That is what makes this book suspenseful and the story engaging. The added historical and occult themes amplifies the mystery. The book’s focus is aimed at several characters, the most integral are Tess Devlin, a single mother to her six year old daughter Maddie. Her inner scars are perfectly reflected by her outer scars. Nick Devlin is her autistic ex-husband who is trying to make a future with his young girlfriend Kyrie. Lili Pillai, her best friend keeps Tess grounded. Frank Lindbergh is a former journalist drowning his grief at the bottom of a bottle and expectant mother Aubrey Pang, a psychic investigator, who spends most of her time debunking fraudsters. All these characters are complex but one thing ties them together; the Harrison House. When Tess stumbles upon Nick’s doppelgänger on the street and Frank is attack by his doppelgänger in his home, it propels the story into a mystery that must be solved for all concerned. Each character has a part to play. Dead Ringers is full of growing suspense and Golden paints a vivid picture of an autumnal Boston; both in the city and suburbia. He knows his location well and uses it to build on the fear. Golden has knack for writing real in depth characters of both genders, they are everyday diverse people especially Tess, whose maternal instinct drives the pace. The layout and pace of the book is clever, Golden keeps his chapters short, revealing only titbits of each character by staggering them throughout the story, right up until the crucial moment when all the characters come together. I enjoyed the way Golden was able to adapt his third person narrative to suit each character and he never shy’s away from the horror. However my only concern was the ending, it felt a little rushed and while the twist was unexpected and shocking, the inciting incident prior was more of fizzle then a bang. This is my first foray into Golden’s own work and I’m definitely becoming a fan. Dead Ringers is the kind of book that could be read in one sitting and multiply times; picking up new pieces of the puzzle you did not know were relevant before. The scares while being subtle are everlasting and visceral. Trust me you'll never look UPS delivery driver the same way again. Written on 1st March 2016 by Tracey Holmes.